One of the most anticipated restaurants of the year finally has an opening date: Petit Trois, the 21-seat French bistro from co-owners Ludo Lefebvre, Vinny Dotolo, and Jon Shook, is set to open tomorrow for lunch and dinner. Of course, don’t expect to get too cozy staring at the portraits of Brigitte Bardot hanging on the wall—the space offers no chairs, only stools and a long marble-top counter that offers a view of the open kitchen behind it. The bar will open for lunch at 12:30 p.m., offering a limited number of sandwiches like pan bagnat and jamon-buerre, sold until they run out. Dinner commences at 5:30 p.m. and will run through 10 p.m. Diners will order from a menu created by Lefebvre and chef de cuisine Sydney Hunter, formerly of LudoBites. Expect it to include classic French dishes like steak frites, mussel frites, beef tartar, confit chicken leg, a Boursin cheese omelet, Boston lettuce salad, and a croque monsieur, the latter of which will continue to be served until midnight. Behind the counter you’ll find a full bar, including simple-yet-classic cocktails created by bar manager Danielle Motor, as well as beer and wines by the glass and bottle. 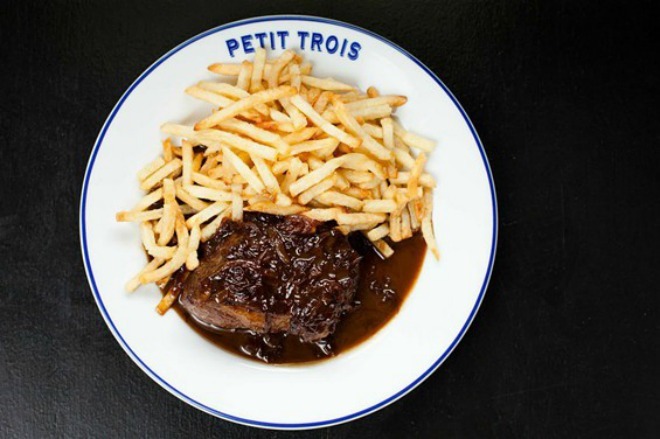 For those who’ve long struggled to manage a reservation at Trois Mec, Lefebvre’s more avant-garde restaurant next door—which offers seating via an online ticketing system—Petit Trois (which translates to “little three”) offers an ironic twist. The bar has a no reservations policy, which means that all 21 stools (and standing space) are offered on a first-come, first-served basis. There will be a wait-list, but you’ll be unable to call ahead to see how long it is: the bar doesn’t plan on having a phone number. Tres contreversial! In line with other Trois Mec policies, Petit Trois will not accept cash (credit card only), will add an 18-percent gratuity charge to all checks, and will be open Monday through Friday only (no weekends! )—though there are plans to expand service to seven days a week later this fall.